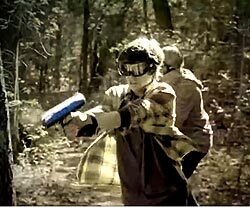 With so many kids finding entertainment in electronics, paintball products and sporting goods manufacturer Kee Action Sports wants to introduce kids to a little more “real world” action via a lower-end paintball “blaster” for boys between the ages of 9 and 15. In the company’s first-ever national advertising for its new JT Splatmaster product, two boys turn their backyard into a forest target gallery the minute they put on their safety goggles. As the boys make their way through the forest, a voiceover explains that the blasters shoot the washable paint capsules up to 100 feet and the ammo “splats when it hits.” The spot ends with the boys taking off their goggles (and magically returning to their yard), as their mother asks “Did you crush my begonias?” while washing off a sign with a hose. The advertising, which broke during the Thanksgiving week, is intended to appeal to tween boys’ sense of action and excitement through some of the same elements that are used in video game advertising, such as desaturating the colors. Secondarily, the commercial is intended to assuage parents’ fears that the blaster is dangerous, depicting the use of safety gear, a mom who is happy her kids are playing outside and easily washing off the paint splatters around her yard. The commercial will air on kid- and tween-oriented networks such as Nickelodeon, Cartoon Network, Direct TV Kids, Disney XD, HUB and MTV. In addition to the commercial, the company is running blogger outreach and public relations programming to get attention for the product during the holiday season.